This season I have been drawn to prints, especially floral prints. There are tons and tons of varieties of prints to choose from but to me summer just shouts FLOWERS. After searching for an hour my friend and I finally found the perfect fabric. 1. Fold your shorts in half and place them on the newspaper. Trace it using a pencil or chalk. 2. Leave a 2cm gap between the outline of the shorts and where you cut the newspaper. This is for seaming the shorts. You may or may not want to reduce the gap on the far straight side of your stencil depending on how snug you want the shorts to be. 3. Fold the fabric in half making sure the far straight side is on the edge. Pin it down and cut around it. Repeat this step twice, making sure the second time the you cut around the edge of the opposite side of the stencil. 4. Lay both pieces back to back like this. 5. Pin and sew down the curve of one side. Not all the way down. 6. Now fold over the top and bottom of the shorts and iron in place then sew. The top seam should be 1.5cm wider than your elastic. 7. Use a safety pin to thread the elastic through. 8. Pin and sew the other curves together. 9. 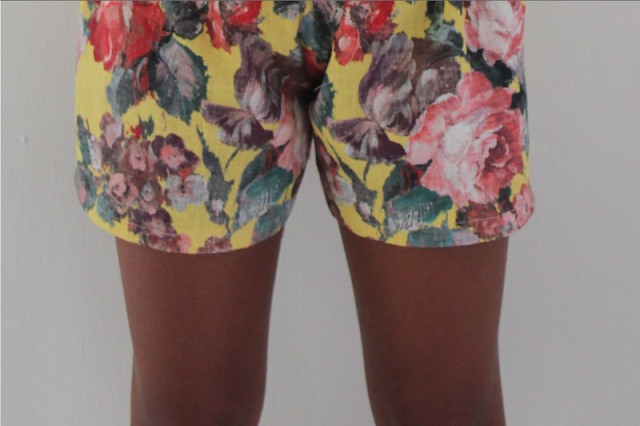 Fold the shorts (still inside out) so that the two sewn seams are facing each other. Pin the unsewn straight edges together so that the edges facing each other are sewn together. Have fun showing off your new florals! Looks great. I'd never make it as well as you did, but the shorts look fantastic. You did an awesome job, great shorts! Omg, it's amazing! I really like your blog by the way, followed you on bloglovin, maybe follow me back? I really love every your blog ! Amazing DIY!!! They look great!!! You make it look so easy. If only I had the patience for sewing. One of the best DIY posts I have seen so far!!! What a great idea to turn old shorts into something more fab!! Keep up the great work and I hope to see more amazing posts like this in the future. If you get a chance, please check out my blog, would love to know what you think.